Continuing the story of The Hobbit, this seven-volume paperback boxed set of Tolkien's epic masterpiece, The Lord of the Rings is a collection to treasure. Sauron, the Dark Lord, has gathered to him all the Rings of Power; the means by which he intends to rule Middle-earth. All he lacks in his plans for dominion is the One Ring - the ring that rules them all - which has fallen into the hands of the hobbit, Bilbo Baggins. In a sleepy village in the Shire, young Frodo Baggins finds himself faced with an immense task, as the Ring is entrusted to his care. He must leave his home and make a perilous journey across the realms of Middle-earth to the Crack of Doom, deep inside the territories of the Dark Lord. There he must destroy the Ring forever and foil the Dark Lord in his evil purpose. 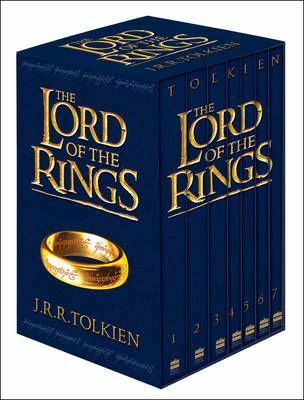 Discover the incredible epic journey of Frodo in a celebratory seven-volume boxed set of fantasy classic, The Lord of the Rings.